[Jeremy] is all about the Arduino, but also into helping people get started working with electronics. He has put together a series of videos on his web site which discuss the basics of using an Arduino. Having just published his tenth tutorial, he dropped us a line to let us know. His videos cover a wide range of topics and include source code, schematics, and a full parts list to help you follow along with him. While the core of his lessons focus specifically on how to use the Arduino to perform particular tasks, he does introduce the viewer to many different concepts along the way. He covers PWM, button debouncing, interrupts, SPI communications, analog inputs, and more – all of which are must-know topics that extend beyond the realm of experimenting with Arduinos. The videos run anywhere from 6 to 20 minutes in length, so you will want to set a block of time aside if you plan on checking them out. If Arduino-specific videos aren’t your thing, he also has a series of general tech-related videos on his site as well which may be of interest. Otherwise, stick around to see the latest in his series of tutorials. As a kid, [Wes] always dreamed of building a full-size, functional R2-D2 droid from Star Wars. While most youthful aspirations such as this fall to the wayside amid adult responsibilities and commitments, he did not allow his dreams to disappear along with his childhood. He began his droid-building journey armed only with his dreams and some assistance from the friendly folks over at R2Builders. The entire replica was built using MDF, wood, and styrene sheeting, along with just one tool: a CNC machine. He walks you through the every step of the construction, stopping to give recommendations on CNC hardware, software, etc. along the way. He also provides Gcode files for each of the pieces he has constructed, which should be a huge help to anyone looking to build a R2-D2 clone of their own. 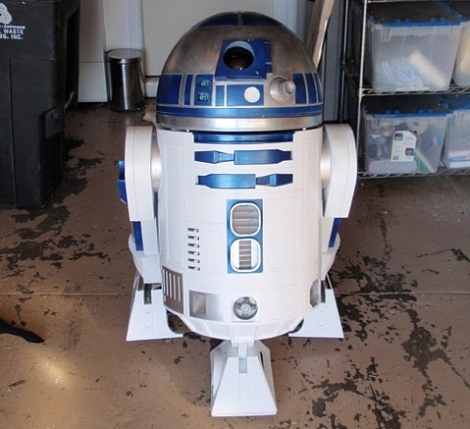 It looks like he is just getting around to fitting motors into the leg housings of his R2-D2 replica, but we can’t wait to see what it looks like once he has all of the electronics and other details finished. If you are interested in more R2-D2 coverage, look no further than right here. In his line of work, Instructables user [Harrymatic] sees a lot of Toshiba laptops come across his desk, some of which are protected with a BIOS password. Typically, in order to make it past the BIOS lockout and get access to the computer, he would have to open the laptop case and short the CMOS reset pins or pull the CMOS battery. The process is quite tedious, so he prefers to use a simpler method, a parallel loopback plug. The plug itself is pretty easy to build. After soldering a handful of wires to the back of a standard male D-sub 25 connector in the arrangement shown in his tutorial, he was good to go. 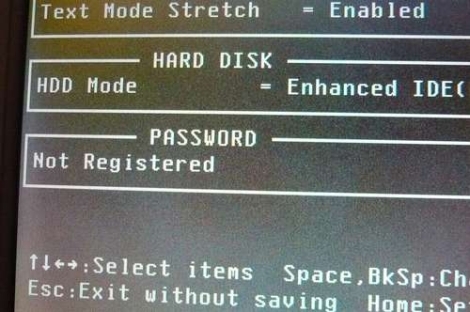 When a laptop is powered on with the plug inserted, the BIOS password is cleared, and the computer can be used as normal. It should be said that he is only positive that this works with the specific Toshiba laptop models he lists in his writeup. It would be interesting to see this tried with other laptop brands to see if they respond in the same way. Since no laptops are manufactured with parallel ports these days, do you have some tips or tricks for recovering laptop BIOS passwords? Be sure to share them with us in the comments. Here’s a way to brighten up enclosed spaces in an environmentally friendly way. 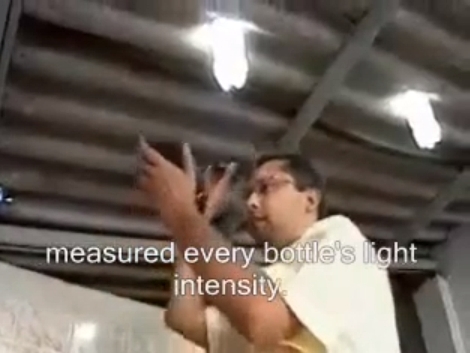 The power of the sun is harnessed using a bottle full of water. Quite simply they’re used 2-liter soda bottles. They’ve been filled with water along with two caps worth of bleach to keep microorganisms out. The cap is then covered with a film canister to protect it from the sun. They are installed through holes in the roof, and in full sun they put out the equivalent of a 50 watt incandescent light bulb. Our first thought is keeping the weather out but that is addressed in the video after the break. With proper weather sealing they do not leak. We might not be installing them in the house just yet, but what a great addition to that dark shed that has no electricity and seems to gobble up yard implements. Perhaps we’ll finally be able to find all of those hand trowels that have gone missing. Here’s a desktop you can take with you. [Rbean] built it at a hackerspace in Milwaukee, Wisconsin (go Badgers!) using very basic materials and techniques. The utilitarian construction of the wooden body reminds us of Cub Scout tool box projects. It features an open space in the top which house the keyboard and mouse during travel. The blue strap lets you sling all forty pounds over one shoulder, but we’d also love to see a thick dowel to go along with the toolbox concept we’ve got stuck in our mind. The lower half of the case is removable, serving as the mounting area for what looks like a mini ITX motherboard, hard drive, and full-sized power supply. As you can see the LCD screen mounts to the side of the box which allows you to rest the unit on its side and protects the display if the whole thing were to be knocked over. [Rbean] mentions that he’d like to try another revision using aluminum instead of wood, but we like this version. The only thing we’d want to see added is a set of speakers mounted inside the case on either side of the monitor. [TechB] is using his mind to control fire. Well, what he’s really doing is using a Mindflex to control a lighter. Many will remember the Mindflex from this shockingly awesome hack. But [TechB’s] approach follows in the footsteps of this Arduino interface for the device. He’s using the Arduino Brain Library to read data from the head-mounted EEG and sending commands to his own fire control system. 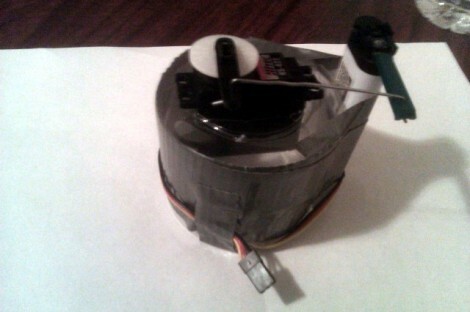 Said system is composed of a cigarette lighter and a servo motor. The motor connects to the gas regulator on the lighter, opening it up when you concentrate and closing it when your mind wanders. The result is a higher flame to show more organized brain function. The only problem with the prototype is the burns you’ll get on your thumb from depressing the lighter’s valve while trying to get your thoughts in order. Check out the video after the break to see this in action. [TechB] is looking a bit like the Borg at the beginning of the clip, making us wonder what other Mindflex hacks he’s already performed. You can make those buttons on your steering wheel much more functional if you have a way of monitoring them. Don’t even think of cracking open the factory finish to get to the solder points, just tap into the CAN bus and monitor the data traffic. The small board seen above is the result of a project [Peter Shabino] calls the CAN sniffer. The connector on the left will plug into the Control Area Network system on your car, giving the chips on board something to do. There’s an MCP2551 CAN transceiver (hidden under that linear regulator) and an SPI controlled MCP2515 CAN controller which take care of the particulars of the CAN protocol. The big chip in the middle is a PIC 16F876, responsible for making sense out of the data. From there a MAX232 chip is used to provide a serial interface to connect the device to a computer.